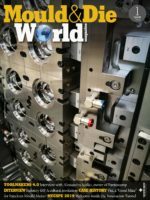 Arburg GmbH & Co. KG is extending its clamping force range in the US market to 730 tonnes with the hybrid Allrounder 1120 H injection moulding machine. 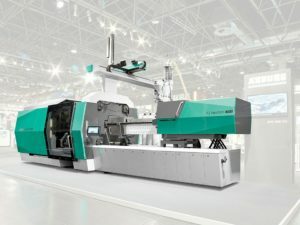 Its largest-size machine is being introduced in the United States for the first time outside Germany at NPE May 7-11. The Lossburg, Germany, injection moulding machinery maker will have the 730-tonne press on display at Booth W1325. The 730-ton Allrounder 1120 H was previously shown in October at Fakuma in Friedrichshafen, Germany. “US moulders have been asking Arburg over and over to continue producing larger machines and, of course, we keep listening,” Kanz said in a news release. With the addition of the 730-tonne press, the company’s machine clamping force range has increased by 30%, he added. Clamping forces for hybrid Allrounders, specifically, start at 39 tonnes. The Allrounder 1120 H can be equipped with Arburg’s Gestica control system, which features easy-to-use operating gestures similar to touch screens on a smartphone or tablet. For example, acceleration or deceleration can be controlled with the swipe of a finger along a bar near the edge of the screen, the company said. At NPE, the press will be molding a folding step stool in a fully automated process. The step stool consists of eight parts made from polypropylene. The parts are produced each cycle in a single shot on a family mold. With assistance from a six-axis robotic system, the 2.4-pound step stool can be made in a cycle time of 60 seconds.